If you think of the shape of Crete resembling a west-facing, twin-horned, wingless dragon, Georgioupolis would be at the base of the dragon's skull. A less picturesque description of this small village's location would be that it is on the north coast of Crete, on the eastern half of the island, 43 km southeast of Chania and 100 km west of Heraklion, tucked away in the deepest, most southwesterly corner of Almiros Bay. The village was named after Greece's Prince George, who served as High Commissioner of Crete, during the final years of Ottoman Occupation from 1898-1906 during which Crete was mostly independent from Ottoman rule. 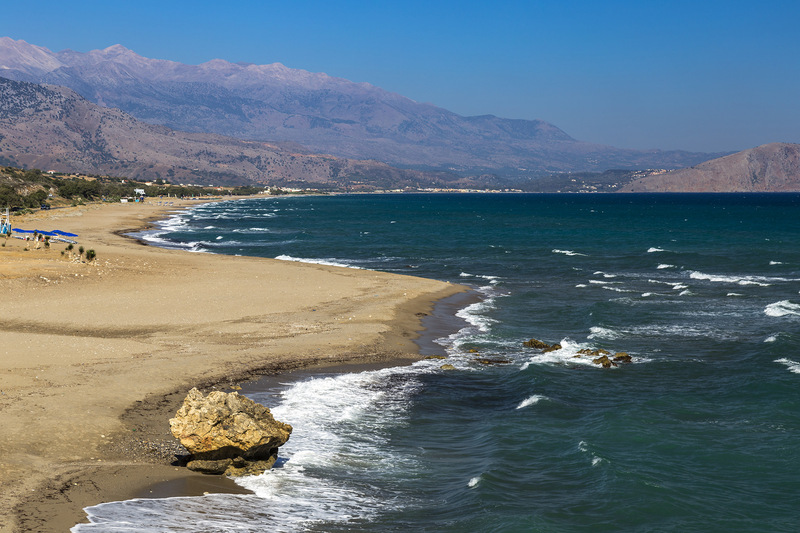 Georgioupolis is the meeting place of three rivers, the largest of which, the Almiros, empties out into Almiros Bay on the Sea of Crete. The water in the area supports the growth of many eucalyptus and plane trees. The old road from the village heading inland to the National Road, paralleling the river, is bordered by the towering eucalyptus, creating a beautiful, shady lane. About 4 km southeast of Georgioupolis is 800 meter-wide Lake Kournas, Crete's only freshwater lake. The area around the lake is a nature preserve. Kournas Cave is nearby. There are a number of small paddle-type boats for rent, and even a beach and snack bars for freshwater swimming, a rarity in Greece. 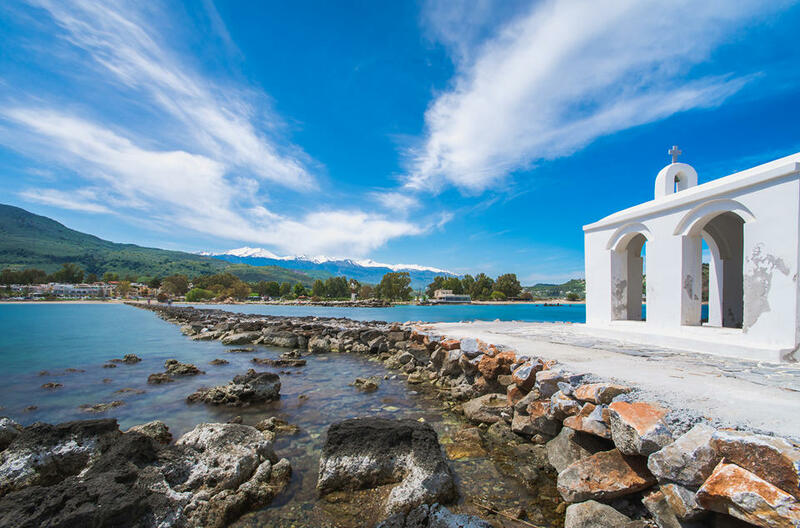 Georgioupolis remains mostly a quiet fishing village with only about 500 year-round residents, but it has seen significant new construction in recent decades to accommodate the growing tourist trade. The area has been inhabited at least from Minoan times (2600-1600 BC), when Georgioupolis, then known as Amphimalla, was the port city of Lappa, about 15 km to the southeast and the site of modern Argyroupolis. There is a Minoan-era tomb in the nearby village of Kastellos, and evidence of ancient pagan worship at Korakia Cave, which is also in the area. In relatively recent history, the Venetians took over Crete in the 13th century, during which time all the coastal villages were re-located to higher ground for security from attack. Almiros Bay, penetrating deeply into the Cretan coastline, proved an ideal location for invasion. For that reason the Venetians built a fort there, which was subsequently torn down in 1821 by locals rebelling against Venetian rule. 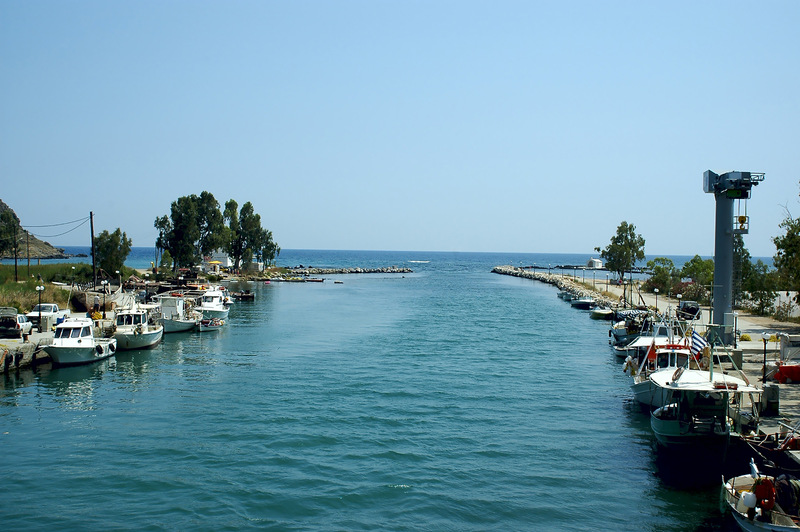 The mouth of the Almiros River (present day Georgioupolis) became a refuge for pirates and smugglers. They would charge travelers for safe passage through Almiros Bay. The river also provided safe haven for the pirates, who could park their ships up to 500 meters inland to keep them safe from attack. Farmers deserted the area, and the fields in the area became fallow. The river delta silted up, and Georgioupolis became a malarial swamp, and virtually uninhabitable. The pirates left. Enter one Miltiades Papadogiannakis, Athenian businessman with a sharp eye for geographical location. Working alone, he began efforts to drain the swamp and entice farmers back into the area. People slowly began moving back. Working together, they drained the swamp. In 1893 they planted hundreds of eucalyptus trees, including those bordering the old road inland. These thirsty trees further helped to dry the ground. The central square or platia of Georgioupolis is heavily trafficked in the evenings by both tourists and locals. During the day the eucalyptus shades coffee drinkers, gossipers, newspaper and book readers, and the usual crowd of political sociological, and philosophical experts. The harbor is about 5 minutes' walk away, again, under the shade of the road's bordering eucalyptus trees This is where the Almyros River empties into the bay of the same name. The riverbank at this point is lined by a key at which fishing boats, inflatables, tour boats, and private boats are moored. Boats are available for excursions on the coastline for fishing, snorkeling, and exploring the caves and cliffs along the water's edge north of the village. 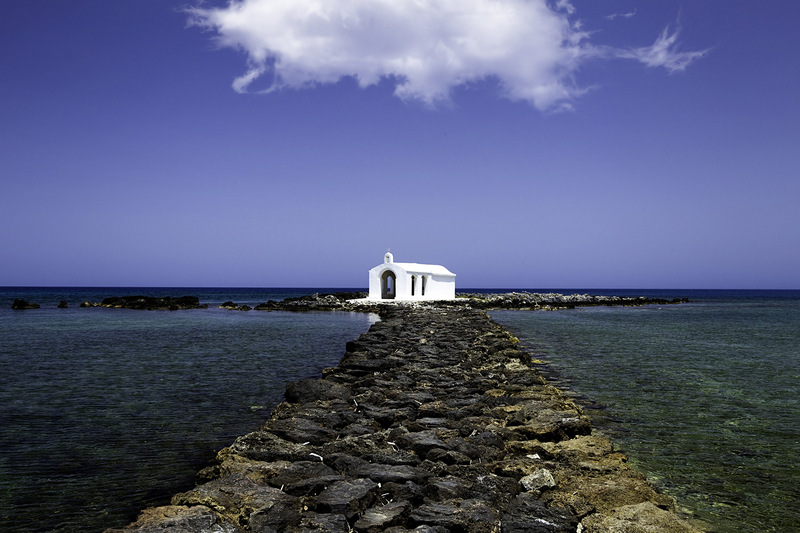 Coming onto the harbor, you see Agios Georgioupolis's most recognizable feature: the small, whitewashed Chapel of Agios Nikolaos at the end of a narrow, 200-meter causeway in the bay. St. Nicholas is the patron saint of the sea. The chapel was on an island until the causeway was built about a hundred years ago to give returning villagers easier access. Just north of the village in a wind-protected cove is pleasant little 300 meter-long Kalyvaki Beach, featuring sun beds under permanent, palm frond-thatched umbrellas and a pleasant outdoor snack bar or two. At the north end of the beach by the resort hotel there are a number of miniature buildings including a mini Athens Acropolis, a mini Frangokastello, and a mini Greek windmill. East of town, the windy, sandy, tamarisk tree-fringed beach stretches 9 km east, offering a lot of choices depending on your desire for privacy or lack of it. 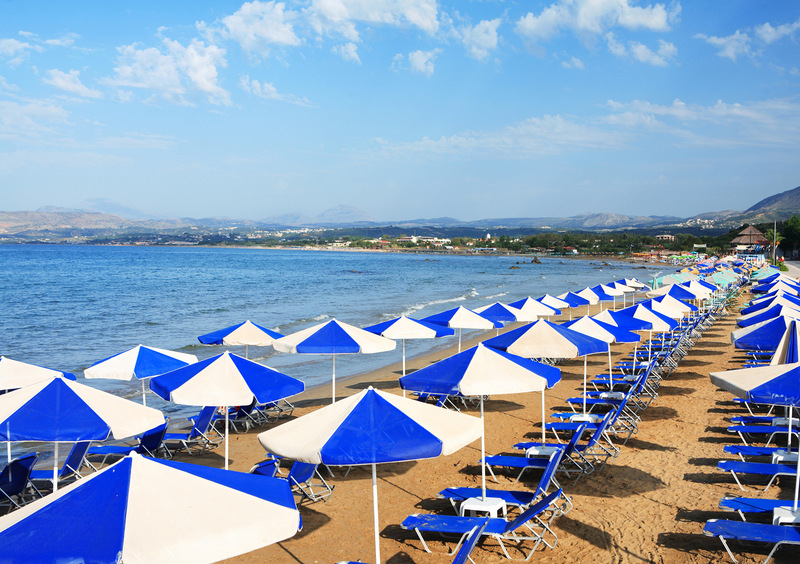 It's one of the longest continuous stretches of sandy beach on Crete. The National Road runs along the beach. Two hundred meters away at its closest point, it isn't much of a spoiler for the "quiet" part of "peace and quiet," especially if you stake out a spot close to the sound of the waves. The road isn't even visible. There are taverns, bars, restaurants and other places of business at relatively close intervals down the 9 km length of the beach. The slope into the water is gentle, which makes the beach kid-friendly. Georgioupolis is a wonderful place for a quiet, family-style holiday. It's also a good base for day trips further afield. Within a half hour's drive you can visit beautiful, interesting Chania, try the beaches and visit the monasteries on the Akrotiri Peninsula, or even head for Frangokastello and Chora Sfakion on the south coast. Georgioupolis can't be beat for a quiet vacation in a great location for surrounding points of interest and some of the best sandy beaches you'll find on the island.